The circular is presented in two versions: a PDF FILE [1.7 MB] and a TEXT FILE with no graphics [144 KB]. This circular outlines the key elements of a comprehensive and effective national strategy for reducing losses from landslides nationwide and provides an assessment of the status, needs, and associated costs of this strategy. The circular is submitted in compliance with a directive of Public Law 106-113 (see preface). A broad spectrum of expert opinion was sought in developing this strategy report, as requested by the U.S. Congress in House Report 106-222. The strategy was developed in response to the rising costs resulting from landslide hazards in the United States and includes activities at the National, State, and local levels, in both the public and private sectors. The strategy gives the Federal Government a prominent role in efforts to reduce losses due to landslide hazards, in partnership with State and local governments. The U.S. Geological Survey (USGS) has taken the lead in developing the strategy on behalf of the large multisector, multiagency stakeholder group involved in landslide hazards mitigation. The USGS derives its leadership role in landslide hazard-related work from the Disaster Relief Act of 1974 (Stafford Act). For example, the Director of the USGS has been delegated the responsibility to issue disaster warnings for an earthquake, volcanic eruption, landslide, or other geologic catastrophe (1974 Disaster Relief Act 42 U.S.C. 5201 et seq). 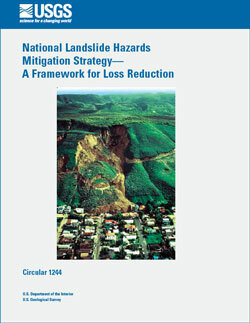 The National Landslide Hazards Mitigation Strategy includes developing new partnerships among government at all levels, academia, and the private sector and expanding landslide research, mapping, assessment, real-time monitoring, forecasting, information management and dissemination, mitigation tools, and emergency preparedness and response. Such a strategy uses new technological advances, enlists the expertise associated with other related hazards such as floods, earthquakes and volcanic activity, and utilizes incentives for the adoption of loss reduction measures nationwide.